Niall Currie has set down a challenge for his Portadown players to maximise the extra points awarded to the Danske Bank Premiership’s basement club by the Irish Football Association. The potential lifeline arrived due to a ruling by the IFA Disciplinary Committee yesterday that found Glenavon guilty of fielding an ineligible player at Shamrock Park on Boxing Day. The 2-2 draw has now been adjusted to provide the Ports with a 3-0 win, with Glenavon also suffering a £350 fine following an appearance by David Elebert which was in breach of the IFA Disciplinary Code regarding “ineligibility through suspension”. Glenavon officials confirmed plans to discuss the option to appeal at a Board of Directors meeting tonight, with the club’s initial defence of fielding Elebert despite his appearance on the IFA suspension list that clearance had been provided by the governing body. Currie is now calling on his squad to use the welcome bonus as a platform for a major push against relegation. “We were disappointed on the day to finish at 2-2 after leading 2-0 and felt the performance deserved a win,” said Currie. “The decision has been made away from the football field and out of Portadown’s hands but our concern must now be to make the most of it. “We are in a position in which anything that can come our way to help is a significant boost, irrespective of the circumstances. Portadown sit bottom of the Danske Bank Premiership table on five points - pending the outcome of any Glenavon appeal - and trailing Carrick Rangers by nine after 24 games. The Ports suffered two league defeats inside five days against, respectively, Ballinamallard United and Glentoran. 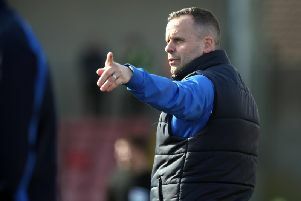 “To stand any chance of staying up we need our senior players out on the pitch as often as possible,” said Currie, who left Ards to join his hometown club as manager in December. “We lost Robert Garrett, Mark McAllister and Garry Breen to enforced substitutions on Tuesday against Glentoran. “We also have players like Sean Mackle, Niall Henderson, Ken Oman and Tim Mouncey all in the stands. “We finished the Glentoran match with a 17-year-old in midfield and 15-year-old up top, although both were really positive.